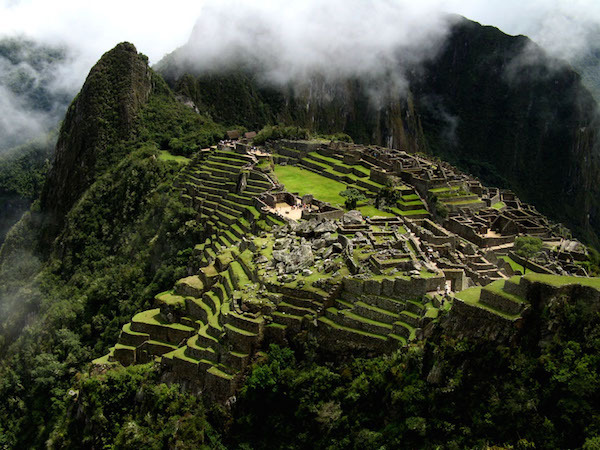 Machu Picchu is often described as “mysterious,” but in fact a great deal is known about its construction and purpose. It was built as a royal estate for the first Inka emperor, Pachacuti Inka Yupanqui, in the middle of the 15th century, on a mountain saddle overlooking the Urubamba River (in modern day Peru). The location was approximately three days’ walk from the Inka capital of Cusco, and nearly 3,000 feet lower in elevation (7,972 feet / 2,430 meters), with a pleasant climate. It was intended as a place where the Inka emperor and his family could host feasts, perform religious ceremonies, and administer the affairs of empire, while also establishing a claim to land that would be owned by his lineage after his death. The site was chosen and situated for its relationship to the Andean landscape, including sight lines to other mountain peaks, called apus, which have long been considered ancestral deities throughout the Andes. The site contains housing for elites, retainers, and maintenance staff, religious shrines, fountains, and terraces, as well as carved rock outcrops, a signature element of Inka art. The site features architecture, from houses to terraces, built by carefully fitting individual stones against each other. Terraces were a common element of highland agriculture long before the Inka. They increased the arable land surface and reduced erosion by creating walled steps down the sides of steep mountains. Each step could then be planted with crops. Terracing took advantage of the landscape and provided some sustenance for the emperor and his entourage during his visits, as well as producing ritually-important maize crops. Further provisions came from the rich lands at the foot of the mountain peak, which were also beholden to Pachacuti and his family. Water management at the site was crucial, and throughout Machu Picchu a system of stone channels drains water from rainfall and from a spring near the site. Some of the water was chanelled to stone fountains. There are sixteen in all, descending in elevation through the site. The first in the series is placed outside the door of the emperor’s compound. That fountain is constructed with walls that may have created a ritual bath for the emperor, connected to his duties as a sacred king who performed religious rituals. 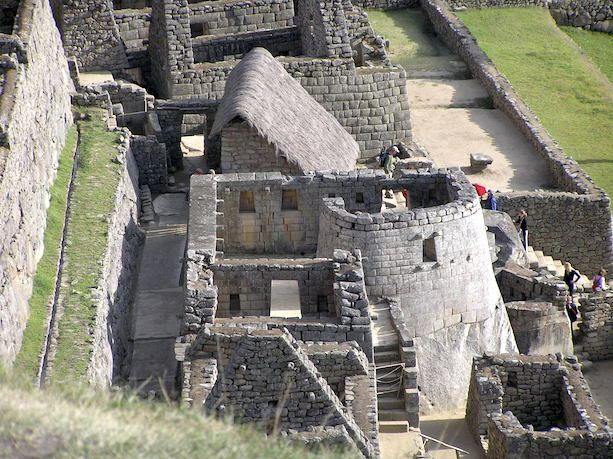 The construction of the main buildings is typical of Inka elite architecture. The walls were built of stones that had been individually shaped to fit closely with one another, rather than being shaped into similar units. This was accomplished by a laborious process of pecking at the stones with tools, gradually shaping them so that each stone was uniquely nested against those around it. Each stone had some sides that protruded slightly, and some with slight concave faces, socketing the stones so that they held together, but allowed for earthquake-damping movement in this seismically active region. Outward faces were then worked smooth, so that the walls resemble an intricate mosaic. Most structures were roofed with wood and thatch. Entryways were in the unique Inka shape of a trapezoid, rather than a rectangle. The trapezoid shape was also used for niches and windows in the walls of buildings. Buildings for people or activities of lower status were made using a rough construction technique that did not take the time to shape the stones. The emperor and his retinue would only reside at Machu Picchu for part of the year. Most of the people who lived there permanently were yanaconas (retainers) and mitimaes (colonists obligated to move to their location). 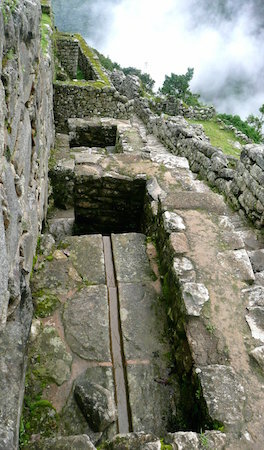 Graves at Machu Picchu have yielded evidence that many of the yanaconas there were craftspeople, including metalsmiths, who came from all over the empire. The ability to command people across the empire and to oblige them to work for the Inka nobility was an expression of imperial power. The buildings of Machu Picchu clearly show the social divisions of the site, with most of the high-status residential buildings in a cluster to the northeast. The emperor himself lived in a separate compound at the southwest of the site, indicating his unique status as the ruler. The Observatory (below) was adjacent to the royal residence, emphasizing the relationship between the elites, religious ritual, and astronomical observation, including Pachacuti’s claim as both a descendant of the sun (whom the Inka called Inti) and the sun himself. One of the obligations of the royal family was performing rituals that sustained relationships with the supernatural forces that drove existence. The number of religious structures at Machu Picchu is high, indicating that Pachacuti and his lineage were heavily involved in the religious functioning of the empire, a task that underscored his right to rule. Also called the Temple of the Sun, this building’s purpose is echoed in its unique shape. It is composed of two main parts: an upper curved stone enclosure with windows and niches placed in it, and a cave beneath this structure with masonry additions that hold more niches. Modifications of the windows in the Observatory’s upper walls indicate that they were used to calculate the June solstice, as well as the first morning rise of the constellation Pleiades and other important constellations. The cave beneath the enclosure may refer to the place of the underworld in Inka myth, making the Observatory a building that embodied cosmological thought as much as it facilitated astronomical observation. 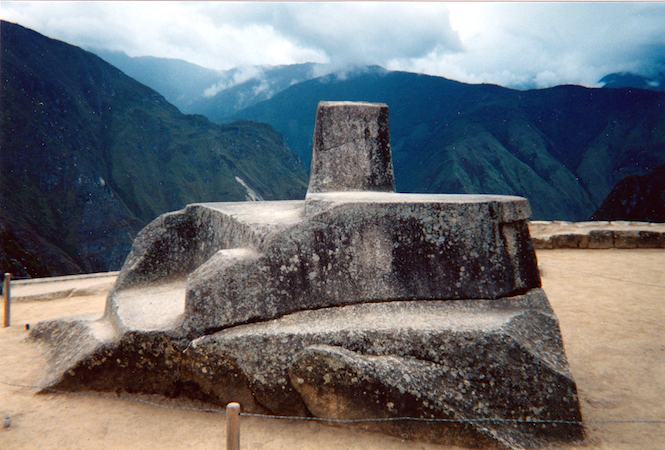 The Intihuatana (“hitching post of the sun”) is a carved boulder located in the ritual area of the site, to the west of the main plaza. Carved boulders were a part of the Inka relationship with the earth, and expressions of belief in a landscape inhabited by supernatural forces. Carved boulders of this type are found throughout the heart of the Inka empire. The stone’s name refers to the idea that it was used to track the passage of the sun throughout the year, part of the reckoning of time used to determine when religious events would take place and similar to the Observatory. Due to its status as an important piece of both global and Peruvian heritage, Machu Picchu has recently become the focus of international attention with regard to both the repatriation of artifacts from the site, and preservation of the existing structures against environmental and human impact. Covered by jungle and known only to locals since the sixteenth century, Machu Picchu was uncovered by Hiram Bingham III, a professor of South American history at Yale University, in 1911. In addition to the structures at the site, he and his team excavated thousands of artifacts, including ceramics, tools, jewelry and human bones, which he brought back to Yale under an agreement with the Peruvian government at the time. The agreement stipulated that the artifacts could be studied at Yale, with the provision that they could be requested and returned to Peru at any time. Since then, most of the objects have been housed at Yale’ Peabody Museum. In a gesture of friendship and in recognition of the unique place that Machu Picchu has come to hold for the people of Cuzco and the Peruvian nation, Yale agreed to return to Peru materials excavated by Bingham at Machu Picchu in 1912. This was the basis of a diplomatic resolution of the dispute between Yale University and the Peruvian government. The agreement was formalized in a Memorandum of Understanding with the Government of Peru on November 23 2010, a second Memorandum of Understanding with the University of Cuzco (UNSAAC) on February 11, 2011, and the return from the Peabody Museum of materials from Machu Picchu in 2011 and 2012. The agreement has resulted in ongoing research cooperation between Yale and UNSAAC, and is an example of how repatriation efforts can lead to new and fruitful opportunities for cooperation. 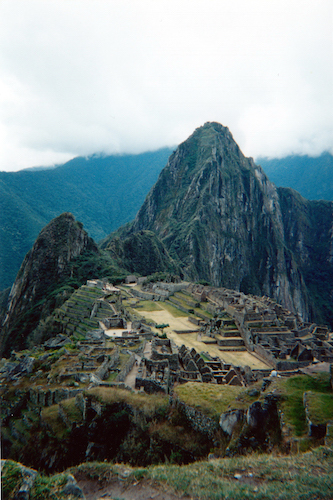 the Historic Sanctuary of Machu Picchu is among the greatest artistic, architectural and land use achievements anywhere and the most significant tangible legacy of the Inca civilization.…The strongly increasing number of visitors to the Historic Sanctuary of Machu Picchu must be matched by an adequate management regulating access.…The planning and organization of transportation and infrastructure construction, as well as the sanitary and safety conditions for both tourists and new residents attracted by tourism requires the creation of high quality and new long-term solutions, and is a significant ongoing concern. Since the time of inscription consistent concerns have been expressed about ecosystem degradation through logging, firewood and commercial plant collection, poor waste management, poaching, agricultural encroachment…, introduced species and water pollution …, in addition from pressures derived from broader development in the region…. Continuous efforts are needed to comply with protected areas and other legislation and plans and prevent further degradation. 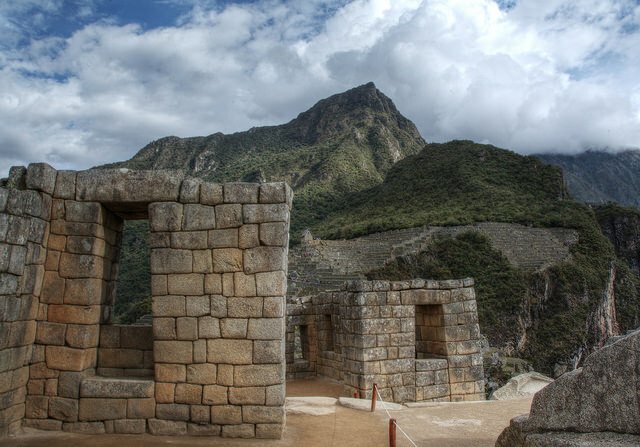 Given the number of agencies involved in planning and protecting Machu Picchu, UNESCO states, achieving an adequate master plan for the site is an ongoing challenge. Machu Picchu is only one of many such world heritage sites around the world that are dealing with the threats brought by increased visitation, and it points to the tensions between the need for everyone to enjoy and benefit from the experience of seeing these magnificent sites, and the need to preserve them for future generations. Richard L. Burger and Lucy C. Salazar, Machu Picchu: Unveiling the Mystery of the Incas (New Haven: Yale University Press, 2004). Carolyn Dean, A Culture of Stone: Inka Perspectives on Rock (Durham, NC: Duke University Press, 2010). Lucy C. Salazar, “Machu Picchu: Mysterious Royal Estate in the Cloud Forest,” in Machu Picchu : Unveiling the Mystery of the Incas, edited by Richard L. Burger and Lucy C. Salazar (New Haven: Yale University Press, 2004). Lucy C. Salazar, “Machu Picchu’s Silent Majority,” in Variations in the Expression of Inka Power : A Symposium at Dumbarton Oaks, 18 and 19 October 1997, edited by Richard L. Burger, Craig Morris, Ramiro Matos Mendieta, Joanne Pillsbury and Jeffrey Quilter (Washington, D.C.; [Cambridge, Mass. ]: Dumbarton Oaks Research Library and Collection ; Distributed by Harvard University Press, 2007). Cite this page as: Dr. Sarahh Scher, "Machu Picchu," in Smarthistory, August 9, 2015, accessed April 24, 2019, https://smarthistory.org/machu-picchu/.